WHERE DID THEY LIVE IN CAIRO? Ambassador and Mrs. Howell with grandson Robert Breslin Howell on Cairo embassy lawn with embassy "sofragi" in backgound. President Harding nominated Howell on October 7, 1921 as American Diplomatic Agent and Consul-General to Egypt then a British Protectorate. 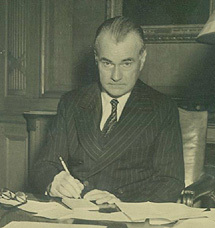 On June 21 of the following year Howell was elevated to the position of Envoy Extraordinary and Minister Plenipotentiary reflecting Egypt's status as a newly established constitutional monarchy. A doctor by profession and a devout Presbyterian by faith, Howell banned the serving of any alcoholic or intoxicating beverages at the American legation invoking as it was the [American Constitution's] 18th Amendment and the Volstead Act forbidding liquor across the United States. The building which then housed the American legation and residence (up until 1934) was part of today's American embassy. But instead of a high security compound occupying an entire bloc, the legation consisted of a stately mansion its main gate facing Lazoghli (now Zahra'a) Street. This villa was later pulled down and replaced by "Villa Chedid" so-named after its Syrian owner. Years later, the US Embassy would move into Villa Chedid before pulling it down in the 1980s. View from Tewhida Yegen's (Mrs. Medhat Yegen Pasha) Palace. Shortly after he arrived in Cairo Kirk during WW2 leased the palace of Tewhida Yegen, a granddaughter of Khedive Ismail, at No. 3 Tolombat Street address sometimes listed as No. 3 Walda Pasha Street. (The palace was replaced by 16 buildings in 1960s shortly after it was sold by its original owner). During WW2 the US chancery which had been temporarily relocated at No. 2 Soliman Pasha Street, moved back to Kasr al-Dubara/Garden City in a three-story building at No. 24 Nabatat Street, Garden City. This building is presently being torn down. Between 1945-46 the US embassy moved once more, this time to No. 6 Rustum Pasha Street. Somerville Pinkney Tuck, Jr. (June 1944 as Minister - then upgraded to Ambassador in 1947) lived with his wife Katherine Demme at No. 7 Saquib Pasha Street in Zamalek where it intersects Mohammed Maraashly Pasha Street. It was Tuck who finalized the purchase of first piece of US government real estate in Egypt. Title of property was personally handed over to Ambassador Tuck in March 1947 by Prime Minister Mahmoud Nokrashy Pasha during the latter's publicized visit to the embassy Villa (where embassy is located today). The villa in question was previously owned by the Chedid family. The adjoining properties consisted of a state school plus the villas of Robert Rolo and Nessim Ades families. These were purchased later by the US government in order to accommodate the needs of a growing US Embassy. None of the original villas or buildings remain today. 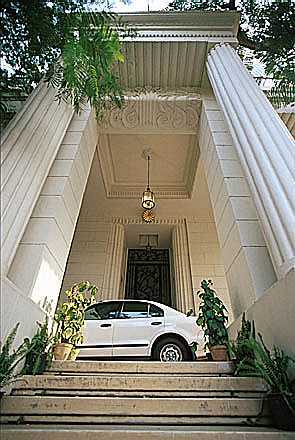 House today property of Swiss Federal Government and home to Swiss diplomats in Cairo. Jefferson Caffery (Ambassador, September 1949 - January 1955) Lived at No. 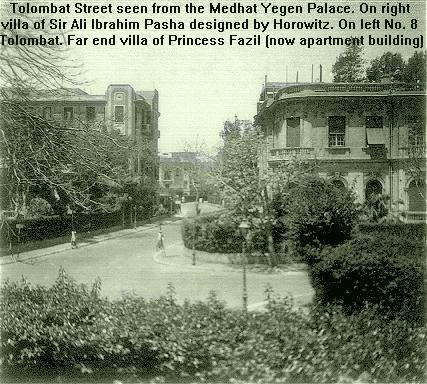 14 Bahgat Ali Street, Zamalek before moving to "Villa Mosseri" in Garden City. 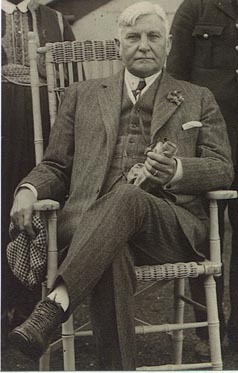 During Caffery's tour of duty in Egypt, DCM Gordon H. Mattison resided at No. 10 Taha Hussein (ex-Willcocks) Street. Artdeco "Villa Badrawi" at No. 5 Ahmed Pasha Street, Garden City. This villa was owned originally by the Boulad-Nahas family from Syria who sold it to landowner Abdelaziz Mohammed Badrawi Pasha MP. 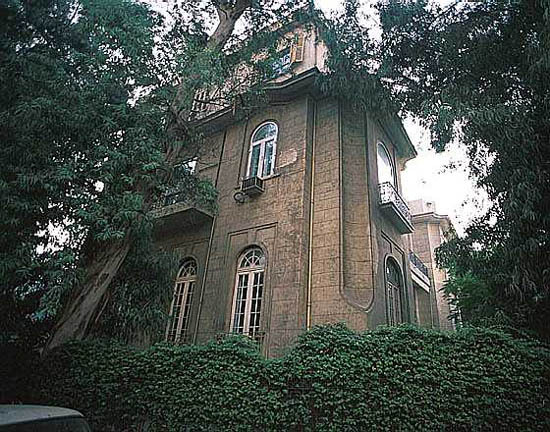 Taken over by one of the latter's heirs, the house became the residence of Tewfik and Nadia (el Gamal) Badrawi. According to Nadia Badrawi the house was designed in the 1930s by French architect Leon Azema. 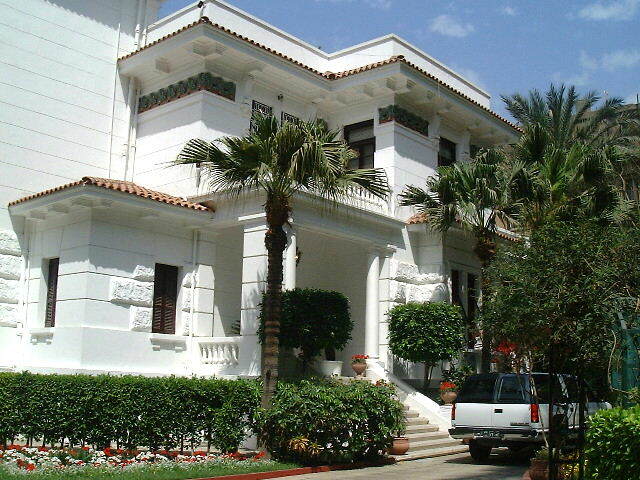 Villa is now property of Japanese government and official residence of Japanese ambassadors in Cairo. 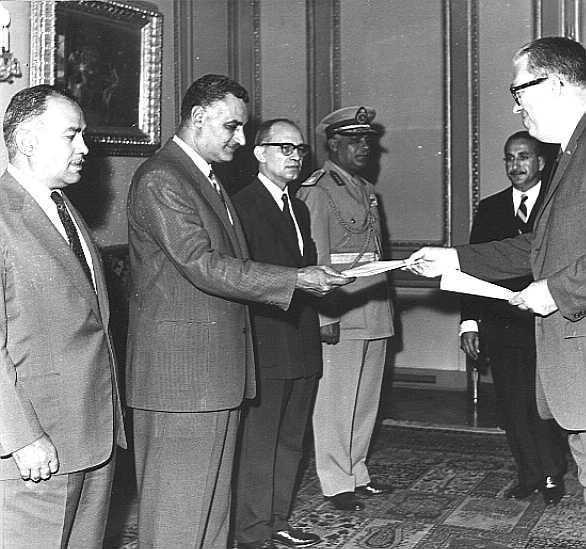 Between June 1967 and 1974 there was no official American representation in Cairo. Donald Bergus who ran American interest in Egypt (under the Spanish flag) lived at No. 10 Taha Hussein (ex-Willcocks) Street. When Egyptian-US relations resumed after the October War there was talk of moving the residence to the suburb Maadi. 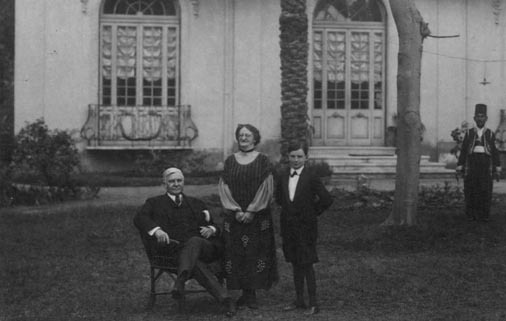 In fact, during Ambassador Herman Frederick Eilts' days, a large property in Maadi was purchased for that specific purpose. The large property had been built for Senator Taher Lozi, a rich landowner and industrialist. Almost as soon as the property was purchased a security wall was built all around. But Ambassador Eilts never moved in. He preferred to remain in Zamalek at No. 10 Taha Hussein (ex-Willcocks) Street. Then there was talk of the new residence built on a large property in Giza on what had been the Wassif Ghali property. The Wassif Ghalis liked to summer in France where they owned a house at La Prieur near St. Remy les Chevreuses. It was also in France that Wassef Ghali Pasha died in November 1957. Louise followed him a few years later, about the time when Egypt's landed aristocracy was sequestered and their property confiscated. Since predators from the new regime were already circling around the Ghali property, Louise Majorelle's heirs heeded the advice of their counsel Maitre Platon Valaskakis and sold the Giza property to the first cash-ready buyer. The French government having exercised its right of first refusal, the choice fell on the American State Department's offer of about L.E. 235,000. A decade later, during Nixon's epic June 1974 visit to Egypt, the American administration allegedly offered the former Ghali property to President Anwar al-Sadat along with a US$ 2 million helicopter. But when Congress raised angry objections, the Americans withdrew their real estate offer leaving Sadat the chopper for his frequent travels. The Egyptian President's elaborate blueprints for an intended new house in Giza were reluctantly shelved. The Americans then proceeded to replace Ghali's arabesque house with a colonial-type villa designed by Washington's Meltcalf & Associates under the supervision of Washington's Federal Buildings Department. The local contractor was Galal al-Abd. 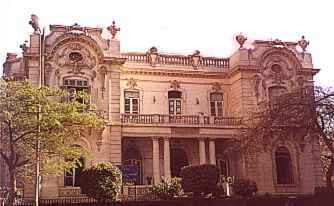 The ambassadorial villa was to become the home of Alfred Leroy Atherton the then-US envoy to Egypt. But if one were to believe diplogossip, the intended Nileside residence was unlivable, plagued with logistical problems, and had sustained serious cost overruns. The official version for not moving in was the house was faulty and fell short of security requirements. America was recovering from Watergate and to avoid additional scandals, the house and land were put up for sale and the entire caboodle swept under Foggy Bottom's carpet with a profit to boot. In Cairo Sadat's speculative economic open door--infitah policies had finally taken hold and Cairo's real estate market had started its dizzying upward spin." Like their successors--Nicolas Veliotis, Frank G. Wisner II and Robert H. Pelletreau--Alfred and Betty Atherton remained in Zamalek's No. 10 Taha Hussein (ex-Willcocks) Street. The Edward Walkers (Ned and Wendy) were the first to live in the new residence located inside the American Embassy compound in Kasr al-Dubara (district now referred to as Garden City) in 1995. Wonderful to review the site, the letters and the memories. I was amazed to see the pictures of the "Maadi House", house 21, road 19. I lived there from 1961-1965 when my father (Donald Bergus) was Counselor for Political Affairs with the American Embassy. The house still had the stables, but one was turned into a laundry room, one was our "rec" room, and the last was for Johnny, our donkey (who could drink Coke out of a bottle). I was amazed to see Alyan, as he was the gardener when we lived there! My brother George, sister Priscilla and I attended CAC. We would either walk to school or ride Johnny. We would go the the Sporting Club for swimming (and yes, Ibrahim was the coach...he must have been very old at that time but he kept all of us in order) and movies outside in the summer, with the bats flying around the screen. Bikes were our major form of transportation, and we had a freedom that was wonderful and innocent. Parties were held at each other's homes, and music on the radio was "At Your Request". Our family returned to Cairo after the 67 War. We were the first family back, and lived in Zamalek. There were very few Americans at that time - CAC total students (pre-K to 12th grade) was 250. I graduated in 1969 with 16 people in my class. Although very different from my Maadi days, it was still a wonderful time. I would love to hear from those that I knew or those who have additional memories of that time. Again, thank you so much for the web site. Subject: Where Did They Live in Cairo? Last evening I went online for the first time in a very long time. Your article was very interesting and I thought that I would give you a bit more information if it is possible to update it. Joseph Morton Howell was my great grandfather. His son was Fred Howell. 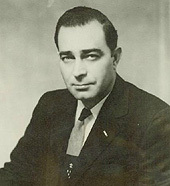 Fred Howell's son was Robert Breslin Howell, who was my father. Ever since I was a small girl, I have known about my "Father Howie" as my father affectionately referred to him as. My father went to live with his "Father Howie" after his mother passed away when he was four. He lived with his grandfather while he was Minister to Egypt and we have several wonderful photographs. One of the photographs has an American flag hanging from the building which may be the residence that you referred to in your article. We have several things that were handed down to my family from Egypt and had wanted at one time to place them in a museum, but never heard from anyone interested. Mr. Joseph Howell also wrote the book Egypt's Past, Present and Future and we also have a copy of that book, which I believe was banned from England at the time for whatever reason. I also have a copy of the original address made in "Father Howies" honor upon his leaving Egypt to return home to his beloved Ohio where he is buried. If you would be interested in any of this, please let me know. Thank you for your very valuable article, especially for those left behind, who remember fondly. Subject: Minor addition/correction + appreciation! Hello, Samir, I have really enjoyed this web page describing the residences and the chronological list of american charges and ambassadors. There is a gap from July of 1973 to November 1974, which was actually 2 other, Marshall Wiley from July 1973 to Aug/Sep 1973 then Richard Smith from August 1973 till Nov 1973 when Herman Eilts actually arrived, however he wasn't installed as ambassador till November 1974. Since my dad is Richard Smith who happened to be the Charge' during the fateful October 1973 war, although not for long, I had to give it a mention.